Dr Pauline Love, Dr Steven Beaven, Dr Jackie Dominey, Dr Catherine Burton produced in collaboration with Macmillan Cancer Support. The ﬁnal part of our special report on cancer and the role of the GP considers issues and challenges around end of life care and palliative care emergencies. In the previous article we discussed the importance of primary care teams in the delivery of high quality end of life care. This time we will discuss current guidance regarding end of life care and consider some palliative care emergencies that may present to primary care. We have linked palliative emergencies within this article as, although uncommon, health care professionals should be mindful of such emergencies when caring for patients with cancer. Recognition in primary care and instituting appropriate management, depending on the patient’s wishes, may greatly benefit the patient. The LCP was developed during the 1990s, based on the care of the dying within the hospice setting, and with the aim of transferring best practice to other settings. The LCP provided guidance on aspects of care including comfort measures; anticipatory prescribing of medicines; discontinuation of interventions that were no longer necessary or in the patient’s best interests; psychological and spiritual care; and care of the family (both before and after the patient’s death). Following concerns, particularly those expressed by families during 2012, the Minister for Care and Support commissioned an independent review of the LCP under the chairmanship of Baroness Julia Neuberger. The Review received submissions from members of the public, health and care professionals, professional bodies and other organisations. The review’s report, More Care, Less Pathway,1 acknowledged the strengths of the LCP, but also described its widespread shortcomings when used inappropriately and recommended its withdrawal. In response to this document, the Leadership Alliance for the Care of the Dying Person (LACDP), representing 21 national bodies, was established. Their report, One Chance to Get it Right,2 set out five priorities of care. Caring for people who are close to death demands compassion, kindness and skilled application of knowledge. The five priorities for care towards the end of life are of fundamental importance not only for patients but also for those close to them. The likelihood of impending death is recognised and communicated clearly, decisions are made and actions taken in accordance with the person’s needs and wishes, and these are regularly reviewed and decisions revised accordingly. An individual plan of care, which includes food and drink, symptom control and psychological, social and spiritual support, is agreed, co-ordinated and delivered with compassion. Ideally, it should be a written plan, a copy of which is given to the patient. The duties and responsibilities of health and care staff to ensure the priorities are achieved are emphasised in the document. The priorities are of equal importance and each supports the primary principle that individual care must be provided according to the needs and wishes of the person. These priorities are similar to the ethos behind the development of the Liverpool Care Pathway. Primary care teams need to understand these Priorities and reflect on how to implement them in their practice settings. Palliative care emergencies may present to primary care. Although they are not common, recognising and managing them may result in marked benefit for the patient. Decisions about management should take into account potential benefits and burdens of treatment and should involve patients and their families when this is possible. The patient’s prognosis should form part of this decision-making process. An intervention may be inappropriate when a patient is very close to death, but may be the best course of action if a patient is expected to survive several days or weeks. Here we will consider the more common emergencies that may occur with advanced disease and where patients may present in primary care. The consequences of untreated malignant spinal cord compression (MSCC) can be devastating. Any cancer can spread to spinal bones, which, in turn, can lead to MSCC. The most common cancers where this occurs are breast, prostate, lung, lymphoma and myeloma. The Scottish audit showed significant delays from the onset of symptoms suggestive of MSCC to recognition and referral by general practitioners and hospital doctors. The median times from the onset of back pain and nerve root pain to referral were three months and nine weeks, respectively. Nearly half of patients with MSCC were unable to walk at the time of diagnosis and of these, the majority (67%) had recovered no function after one month. Of those who could walk unaided at the time of diagnosis, 81% were able to walk (either alone or with aid) at one month. The ability to walk at diagnosis was also significantly related to overall survival. These findings underline the importance of early recognition and treatment of MSCC, in order to preserve function. Not only is preservation of mobility important, but preservation of continence makes a huge difference in maintaining dignity at the end of life. Early detection of MSCC – how can we improve this? Inform patients with or at high risk of bone metastases, their families and carers about symptoms suggestive of MSCC and what to do if they develop. Consider using leaflets. In primary care, limiting the patient’s mobility and giving high dose steroids (dexamethasone 16mg daily) may prevent neurological deterioration. For patients with sufficient life expectancy to benefit from treatment, which would entail either radiotherapy or occasionally surgery, an emergency referral should be made. Hypercalcemia occurs in 20 to 30% of patients with cancer.5 It occurs in patients with both solid tumours and haematological malignancies, most commonly in breast and lung cancers and multiple myeloma. Malignancy is often evident clinically by the time it causes hypercalcaemia, and patients with hypercalcaemia of malignancy often have a poor prognosis. Symptoms of hypercalcaemia can be distressing for both patient and carer. Checking serum corrected calcium and U&E will identify patients and inform treatment which may make a striking difference to symptoms. Elderly patients are more likely to be symptomatic from only moderate elevations of calcium levels. Treatment consists of replacing fluids that may have been lost through vomiting or polyuria, and intravenous administration of bisphosphonates – in some areas this could be done in the home or in a day hospice setting. Superior vena cava obstruction (SVCO) results from pressure on the SVC from tumour masses in the superior mediastinum. It may also be due to tumour involvement of the vessel and formation of mural thrombus or thrombus formation at the tip of central lines used for chemotherapy. Lung cancer is the most common cancer causing SVCO but any cancer that leads to mediastinal lymphadenopathy can also be a cause such as: lymphoma, testicular, breast, bowel or oesophageal cancers. SVCO may develop over a few weeks or even days. This will depend on the patient’s prognosis. 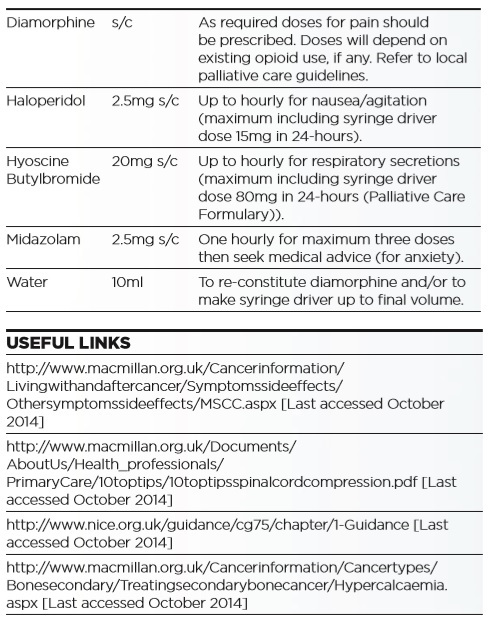 If close to death, simple measures such as analgesia, anxiolytics/ sedatives and diuretics may be appropriate. Oxygen, elevating the bed head and high dose steroids may reduce symptoms. Radiotherapy, chemotherapy, stenting, anticoagulants may be alternative options depending on the advancement of the cancer and the severity of symptoms. If significant warning haemorrhages have occurred, medication (midazolam 10mg) should be immediately available in the event of a major terminal haemorrhage. Red or dark green towels may lessen the frightening sight of blood loss. Massive haemorrhage from the arch of the aorta in bronchogenic cancer or the carotid artery results in death within minutes. It is appropriate to simply stay with the patient in this circumstance. If a major artery is eroded by a malignant ulcer, for example, in the axilla, face, neck, or groin, midazolam could be administered. It is important to stay with the patient until the bleeding is under control and the patient is settled. A comparable approach can be adopted with severe acute haematemesis, fresh melaena, and vaginal bleeding in a person close to death. Anticipatory care and advance care planning are essential to achieve high-quality end of life care. Communication with the patient, their carer and the wider healthcare team such as the out of hours service, continuing health care, community nurses and the Ambulance Service is imperative to ensure a good death in the preferred place for the patient. The prescribing of anticipatory medicines is essential for good symptom control and examples are given in the table below. Did you know that three ampoules each of diamorphine, haloperidol, hyoscine, midazolam and water costs less than £20? How much does an emergency admission cost to allow for symptom management? And what is the physical and psychological cost to the patient and their carer if no anticipatory medicines are available? It is important to recognise promptly, and where appropriate to investigate and treat palliative care emergencies. Good communication with the dying person, their carers and the multi-disciplinary team is essential for high-quality end of life care in the preferred place of care. 3. Levack P et al (2001) A prospective audit of the diagnosis, management and outcome of malignant cord compression (CRAG 97/08). Edinburgh: CRAG. 4. Loblaw DA, Laperriere NJ, Mackillop WJ (2003). Clinical Oncology 15 (4): 211–17. 5. Stewart AF. N Engl J Med 2005; 352:373.